Before I was a mom I was pretty confident that I would be an ap (attachment parenting) mom. My babies would be in slings, I wouldn't have a nap schedule, we'd probably co-sleep, and I'd do "time-ins" instead of "time outs." All of this builds confidence in children and promotes "peaceful parenting", as ap-ers would explain. I quickly learned that my kid did not like slings, wraps, or anything else carrying her that wasn't my two arms. I also learned that if I didn't schedule my day - including time for a nap - and have everything at roughly the same time every day my kid would not thrive and I would fall apart. It didn't take long to realize I did not sleep well with my baby in bed with me. In fact, I don't sleep well with my babies in the same room as me! And when I am mad at my child the last thing I want is for anyone to talk to me or touch me. A time out is beneficial for me, probably more so than my kids. What I learned is that I don't like a lot of physical touch, something that ap seemed to be pretty big on. I did not see any of this coming. For awhile I tried to fight myself, convinced that what the attachment parents were saying was true: my children would be stupid, hoarding, serial killers if I didn't wear them in slings, co-sleep, homeschool, never force a nap time, never let them cry for more than 2 minutes. Of course those weren't their exact words but the tone and body language of most ap moms I knew made me feel like a horrible excuse for a parent and a complete failure of a mother because what worked for them and what nature clearly intends for children to need in order to thrive didn't work for me. See what I mean? That language, "what nature clearly intends for children to need in order to thrive;" was some exact words - or variations of - and so of course the ap movement made me feel like crap! I was very, very hurt. I was struggling in my role of motherhood and I was especially troubled because I thought it would be so easy. Yet the very way I was told to parent - the way I was told Nature (and therefore GOD) wanted us to parent - was not how I wanted to parent. It wasn't working for me. I became angry and resentful towards a lot of those women, especially when they'd post a link to some study on Facebook, citing how moms who let their kids cry for more than 5 minutes are raising damaged monsters. Honestly, I think I got hit harder with all of this because I'm part of two groups (natural-family-planning-practicing Catholics and home birthers) that are a lot more ap then other groups I've encountered, in part because of the big emphasis on breastfeeding. Trying to do "peaceful parenting" made me exhausted and worn thin. So much so that when things didn't go well I would scream my head off, punch the walls, and curse at my kids. When I tried explaining this to ap-ers I was told to do a "time-in" with my kids, hugging them instead of sending them to time out. They didn't seem to get it. And my life, home, and parenting was anything but peaceful. It took me awhile, but I finally figured out what I need to do to parent my kids successfully. We have a schedule. Quiet time/nap time happens at about the same time every day. I will keep my kids up a little bit longer so all three nap at the same time because I need quiet time, too. I nurse my kids in a chair in the middle of the night - not in bed. I introduce a bottle fairly early so I can go out and be by myself. I'm sure to some I sound like a horrible, monster of a mother. But I really need to not touch my kids all day long. I really need a good hour break in the middle of the day when no one talks to me, hugs me, kisses me, sits on my lap or comes close. Having these breaks allows me to give plenty of physical affection to my children during the rest of the day. Maybe it's the introvert in me coming out; whatever it is, it's the way I need it to be. I am a better mom for it. Those breaks are my sanity. Seriously. 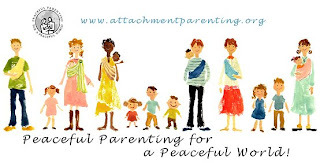 In the end it was figuring out what "peaceful parenting" looked like in my home that made me let go of a lot of the hurt I felt towards the attachment parenting people I know. I also started telling them how their language made me feel belittled and unfairly judged. I started discussing with them my experiences in parenting. And suddenly they started apologizing, empathizing, and explaining things in less polarizing ways. Of course there may have been a few fights I picked on Facebook along the way, but I'm pretty embarrassed about those now that my anger is gone. If you were on the receiving end of my pettiness, I'm sorry! 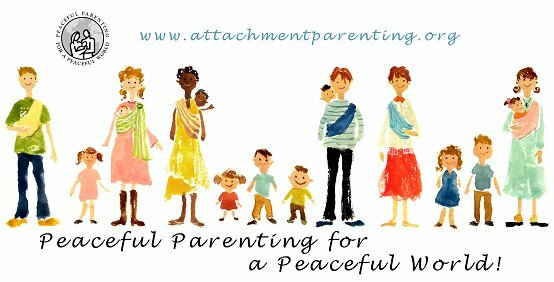 I do not consider myself a "peaceful parent" - not in the way the attachment parenting movement would explain it. But I would consider myself a good mom, and so would m thriving, happy, healthy kids. And that's what matters. Ok... your experience is the OPPOSITE! How you are now, I envisioned our household. What I have is sleeping anywhere, whenever, eating whatever, however, and wow... nothing I would have imagined. As a guy... a pretty conservative one at that, I am more into baby wearing than my wife. I love cloth diapers... seriously... maybe someone is playing a trick on you and us and our babies were cosmically switched? I should say that my rules aren't strict. We try to be dressed and ready for school/play/errands by 9-9:30. We eat around 11. We nap anywhere from 12:30-2. So there is some flexibility but there are definite rules and guidelines. I'm glad you wrote this! I often felt bombarded by AP principles from people. I NEED a schedule. I need to be able to know what's coming. I always knew I would need that and as I see Anna thriving, I know that I'm doing what is best for my family. I had to learn (and help others understand) that families need to work out what's best for them and not fit a mold, AP or any other. My personality doesn't handle "go with the flow". It makes me crazy! Bonnie, thanks for writing this. I don't have kids yet, I want to AP, and of course since I have no kids I am a parenting expert (heavy, heavy sarcasm). But sometimes I unnecessarily worry about whether I'll do it right. I've never even thought about what if I just don't parent that way. I guess all the books in the world won't tell me how I WILL react, despite how I WANT to react huh? That being sad, I'm pretty sure if you clearly shower love on your kids, and let them touch you at least *some* of the time :-) then they'll be fine. My sibs and I are at least, and my mom's not really a touchy feely person. The best way I've heard AP explained is using your maternal instincts to do what is best for you and your children. That can include one or all of the AP principles. I do some AP stuff some of the time, but not all of it all of the time. I agree that some AP people/discussions can be quite polarizing and condescending, and that is sad. I loved your last line about being a "good mom" - just a couple days ago I was in tears, overwhelmed with lots of different things, and Lucas just kept hugging and kissing me and telling me that I'm a "good mommy." His words were exactly what I needed to hear! We started out practically Ezzo-parenting our oldest. Physical touch is NOT my love language of choice. (my poor dh!! ;) )Somehow along the way we ended up looking more AP than not, and for us, it works. I do most things one handed, or Isaac is in a back carrier OR flushing items down the toilet and trying to eat non food items. I do want to point out that it can go the other way, too with the labels. Ezzo has a very popular series entitled "Growing Kids God's Way" which basically could be summed up as you're not doing things God's way if you don't whack your kid every so often with a specifically purchased piece of plumbing! Our kids grow up so fast. I wish I could take back all of the "get me out of here - get me help!" feelings that my younger self had with my younger kids. missing my very far away (and obviously very secure-in-himself) college son atm!! Glad you found what works for your family. I know these people are well meaning, just like the home birthers/natural birthers and le leche league folks, but some groups just plain make people feel bad unnecessarily. I am glad you found what works for you and made peace with it because, truly, this isn't really a right/wrong issue like some folks make it out to be. I know they are well-meaning, but sheesh! structure isn't evil, kids often thrive on structure and sleep better/longer. I know mine do. And I need time outs too. My children know I love them, and they also know what to expect. It makes them more confident. It works for us. I am glad you found what works for you too-without the guilt! p.s. you know what I got for a kid that slept in the sling? a child that grew out of the sling and didn't want to sleep in his bed! I want to say thank you so much for this post! I have also had to make peace with the Attached parenting method too. I also thought that my baby would be in a sling; only at the grocery store or going for a walk will I put her into a sling. I also thought I would never use a pacifier....well I do! I kind of want to say 'get over it folks:) I only use the pacifier when she is napping or when we are in the car; I cannot seem to drive when I have a crying baby. I think that every mother is different, and YOU know what is best for you and your children! Also if it is keeping your sanity, than Praise the Lord! I am also a NFP Catholic woman, and I have met these groups where they think: your kids will turn out to be one way, if you do xyz. Not true!!!! No book or group can tell you how to raise your children. Also, every child is so different; it’s how God created them! Thank you again for post this, I am glad someone is feeling the same way I am! Hi Bonnie, I'm new to your blog and loving it thus far! This post was great. My son is 18M old now and I have had the same, but opposite experience of you. It's so funny. Before he was born I said he would never sleep in my bed, that I needed to let him cry it out, and didn't even know about baby wearing! But after he was here, my husband and I just did what felt right for us and we co-sleep, are still nursing, and lived in the Moby Wrap for months, etc etc. I had people around me yelling about how I'm going to ruin him and spoil him (still do). I had many good cries about it when everyone around us was saying what we were doing is wrong. But it felt so right! I guess I would technically fit into the AP camp, but I never read about how to be an AP, I just did what I thought was best for us. What we did this time might not work for the next baby, so we need to be flexible. I think what both of our experiences show, is that as parents we need to trust our instincts and instead of following a parenting mold, do what works for us and our kids. Thanks! I have occasionally had similar feelings. I was raised in a "baby schedule" house - and still think my mom did a great job with the 5 of us - and only read about AP, but there were still some things that I was like, "yeah, that's not going to work for us." I've taken Isaiah into our bed on rare occasions, and I can't sleep for fear I'm going to squish him. And there are times when I swear that going in the bedroom after 5 minutes of crying distracts him from his winding-down-from-overtired process, and he probably would have been asleep in another 90 seconds if I hadn't gone in there. Since every kid is different you just have to do what works for your family...it's unfortunate that people from all different camps convey a "my way or you're screwing them up!" attitude. This made me think about how I would feel so embarrassed to bring my baby to LLL League with a pacifier :) True story. Love those ladies, but I know the feeling of thinking you are being judged. Bonnie, you and I are very similar in this area. Great post. Honesty like this makes me want to jump and cheer. I was down on anyone who wouldn't practice attachment parenting - *before* I had kids! I tried reusable diapers, on demand feeding, co-sleeping and so on for 8 weeks with my firstborn before my brain and body had a complete breakdown. Three children in and I know to do what works best for them and me, not what some book says. We are all thriving. I am all for AP families thriving too, but it's not the *only* way to make a happy family, and I would love for people to be more understanding of different parenting skills. Thankyou for posting. I'm with you on this! I had so many preconceived notions about raising kids, and none of them panned out. In fact, my parenting style sounds a great deal like yours. Baby had her own room from week one. It was necessary for all of us...she never slept well with us in the room either. For me, as an adoptive parent, the ap crowd comes across as even more offensive at times because of the emphasis on breastfeeding. I know it's unintentional, but since breastfeeding was never an option for us, I kind of felt on the outside with this group from the start. We also had child who asserted her independence from an early age. Yes, she likes to be cuddled from time to time, but on HER schedule. Starting at around 6 weeks, she got squirmy and very irritated if you held her too close or too long. "Seriously, mom, put me down already. There are some shiny toys over there that I want to examine, and I want to work on my rolly-polly action. Your constant need to swaddle/sling/strap me down is seriously cramping my style!" Attachment parenting is great for some kids and some parents. But it's not for everyone. I have come to realize that every kid is different and every parent is different, and people have to make their own decisions about what is best for their family. I know this is old but I never took the time to say that I relate to a lot of what you said in this post. I have spent a lot of time feeling bad for not doing things the way I was "supposed" to. But you have to find what works for you and then let other people think what they will. Good post. Glad you are at peace with it now.